It's the middle of summer, it's boiling hot, and all we want to do is walk around in the tiniest amount of clothing possible, while fanning ourselves and drinking endless iced coffee. Well, according to one shopping mall in Alabama, dressing for the weather is 'inappropriate' and will get you kicked out. 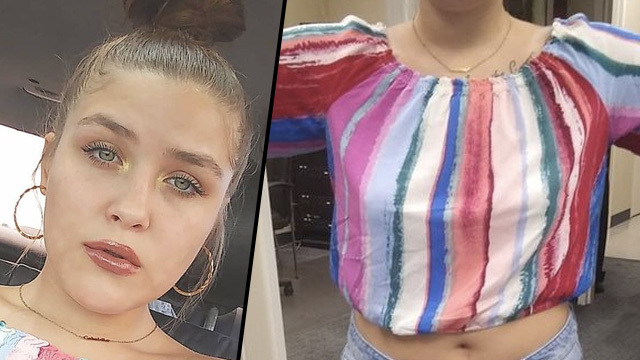 That's what reportedly happened to 19-year-old Gabrielle Gibson in Bellair mall, Mobile, Alabama on August 1st, when she dared to enter the shops in some short denim shorts and a multi-coloured long-sleeved top. I was literally harassed and kicked out of the Bellair mall in Mobile, AL today because of what I'm wearing. Apparently grown men couldn't contain themselves so I get kicked out. Security officer J. Mathis initiated that he was looking at my a** cheeks and it was a problem. Don't look at my a** then theres a thought? They went as far as to threaten to call a police officer. From what I seen today everyone had short shorties on. I mean come on its August and 100° outside. I don't know why i was pinpointed. Im just disgusted with the behaviour of all these people. When I left the house I felt beautiful and happy about myself, but having grown men attack me about what I'm wearing when I'm just trying to walk around and buy things was just so excessive. They didn't have to throw me out. It's a sad day when grown men can't control themselves. I just don't want anyone feeling like I did. Many people on social media were supportive of Ms Gibson, and couldn't understand why she would have been thrown out of the mall. There is NOTHING wrong with what you are wearing! I would have told him to call the police. You did absolutely nothing wrong. You are beautiful and you wear what you want!! Given the high degree of importance we place on maintaining a family-friendly shopping environment, our policy requires all of our customers to dress in a manner that reflects our code of conduct. Anyone who violates this policy will be asked to change or to leave the premises. All we can do is congratulate Gabrielle for calling out the everyday sexism, and encourage her to keep wearing whatever makes her happy. Keep doing you! ●　●　● ＿＿（ "''''''ヽ.